and more available in our shop! Carefully crafted independent games mixing old school presentation with modern design. A fine blend of super cute pixels and dark occult secrets. Every morning dozens of stray dogs make the commute by train from the Moscow suburbs to the downtown core in search of food and fortune. Russian Subway Dogs is an arcade score-attack game inspired by the real life stray dogs of the Moscow Metro. Featuring a distinct visual style that blends pixel art with paper and ink textures, They Bleed Pixels is a singular mix of intense platforming and fierce beat 'em up action that tells the story of a young girl haunted by a mysterious book and her violent Lovecraftian nightmares. A 16-bit style survival horror game with fully voice acted dynamic narration. You're lost in the forest, surounded by supernatural squiddy things with only your shotgun and threadbare sanity to defend yourself. Explore the forest and survive till dawn. 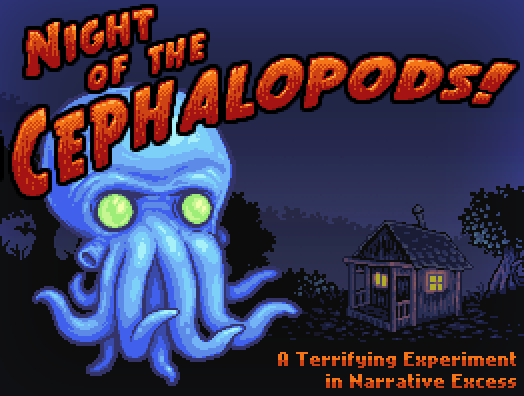 A 2-player local co-op game set in the world of Night of the Cephalopods. Lady Amber Pennyworth and Winston Mainspring have found their cottage lab besieged by foul eldritch octopi. Armed with only a hammer and a fowling shotgun of low grade birdshot, they must defend the cottage for as long as they can. Team work is ESSENTIAL! A 2-4 player one button game where balloons battle each other to collect pollen above a sea of ink. Steampunky art nouveau inspired artwork meets accessible four player competitive gameplay!